As summer winds down, we need to think about our skin. I live in Alaska, and there is nothing that Alaskans love more than the sun! We wring every drop of living out of our long summer days, basking in the glow of sunshine and working like mad to get all our outdoor projects done before winter descends again. But all that sun and outdoor activity takes a toll on our skin, particularly in our low humidity environment. A finished jar of Calendula Salve. Here are a few products you may want to check out to give your skin a boost, plus a favorite salve recipe I use for just about everything skin-related. Green Tea Extract would make a tremendous addition to lotions, lip balms, and even salves. It offers anti-aging properties as well as sunburn protection. I’m thinking of a soothing after-sun lotion using green tea extract and Aloe Extract. I bet it would do wonders for windburn as well! Sea Buckthorn Extract intrigues me for its cell healing and regeneration aspects as well as its long history of use. It is prized because the oil contains high amounts of a rare fatty acid that aids cell tissue and wound healing. I can’t think of anything more suited to caring for stressed skin! The best part about these extracts is that they are eligible for inclusion in our Amazing Dozen Free Shipping! Just choose 12 one fluid ounce bottles of Fragrance Oils, Essential Oils, Extracts, or Flavor Oils. It’s a marvelous opportunity to experiment! Now here’s that salve recipe I promised. The first thing to do is create an infused oil. It couldn’t be easier! Use 2 ounces of calendula for one pint of olive oil. Just pour the olive oil into a slow cooker, stir in the calendula leaves, set the dial on low, and leave it alone to do its thing for a couple of hours. When you come back to it, unplug the slow cooker and allow the oil to cool to room temperature naturally. You can hurry the process along a little bit by removing the crock and setting it on a potholder on the counter. Pour through a fine-mesh sieve lined with cheesecloth and discard the used calendula petals. Tada! You have created a skin-soothing infusion that makes a perfect base for a salve. No time to make an infusion? No worries! 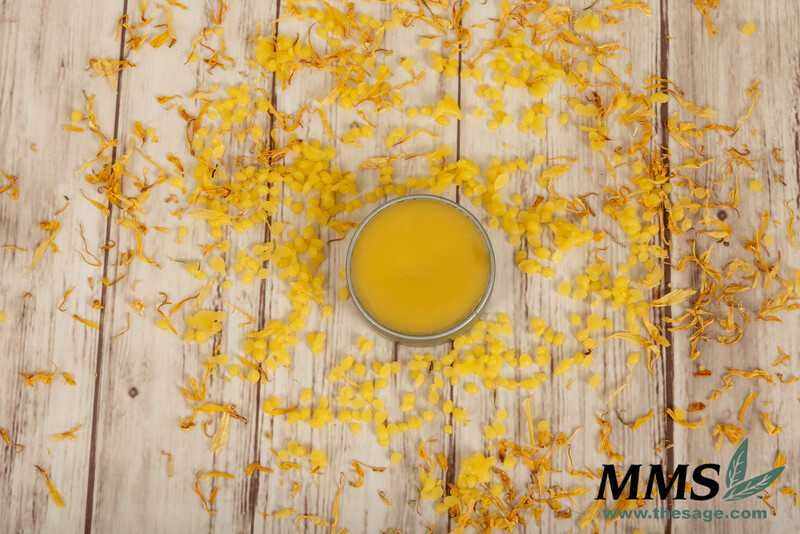 Use our Calendula Oil Extract. Now create your salve. In a double boiler, gently heat the pint of infused oil and add 4 tablespoons beeswax. Give it a gentle stir often to help melt the beeswax, and don’t let your oil get too hot. Just keep the water in the pot simmering. When the beeswax is completely melted, you may choose to add an essential oil. There are many wonderful essential oils that would work well in this salve. Lavender is my favorite, and MMS has several varieties – I like to add about 20 drops of lavender. It adds a nice scent as well as the soothing properties for which lavender is known. Helichrysum is another skin-soothing essential oil that works well here. Use it more sparingly, as it is one of the more costly essential oils. Carrot Seed Essential Oil also lends benefits for a skin salve, particularly for aging skin. Before packaging the salve, dip a spoon into the liquid and allow it to cool to test the consistency. If it is too soft for your purpose, add more beeswax; too hard, add more oil. (If you used all the infused oil, you can use plain olive oil.) Start small – just a tablespoon or so of oil or a teaspoon or so of beeswax. After pouring salve into jars (this recipe will fill four 4-oz. jars with a small amount left over), let it cool completely before putting on the lids to avoid condensation forming inside the container. Don’t let mold or rancidity ruin your creation! I use this salve on scrapes, cuts, and burns. It’s also wonderful rubbed into my hands when I’ve been doing lots of dishes or working outdoors. My cuticles always need a bit of moisture, and this salve delivers. I like to keep a ¼-ounce lip balm container of this salve in my purse so I can rub it into my cuticles often. It is very nice on my feet at bedtime – I rub it onto my feet and then slip into cotton socks. I won’t say it completely takes away callouses, but it certainly makes my feet feel much softer! I also keep a jar of the Calendula Balm in my milking room for my goats. It is very soothing for chapped udders, and I dab a bit on any scrape or bump I notice on them. How do you get ready for fall? Leave us a comment.